Metal indoor dog kennel buildings are the perfect low cost, low maintenance solution for professional dog breeders, kennel operators, trainers, rescue teams, military & K9 police units. 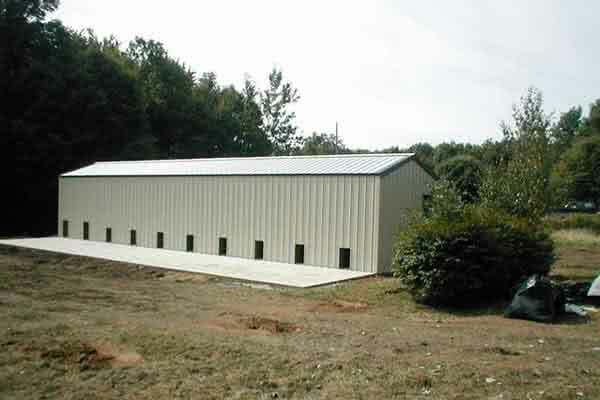 Long lasting, low maintenance pre-engineered buildings are comfortable, secure and customizable inside and out. And 100% pooch friendly! 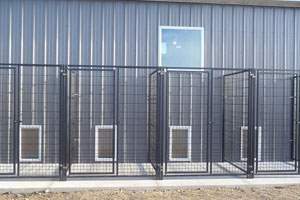 With a wide range of uses and available across the United States & Canada, metal is not only the modern choice, but the ideal choice when building a kennel facility. Reduced construction time and enhanced kennel quality because metal does not splinter like wood. This also adds up to a safer environment for animals in your care. Lower material and labor costs equal savings of up to 60% over traditional construction. Modular by design. Build on as your business grows. Prefabricated components and bolt-on construction makes add-on expansion easy and inexpensive. 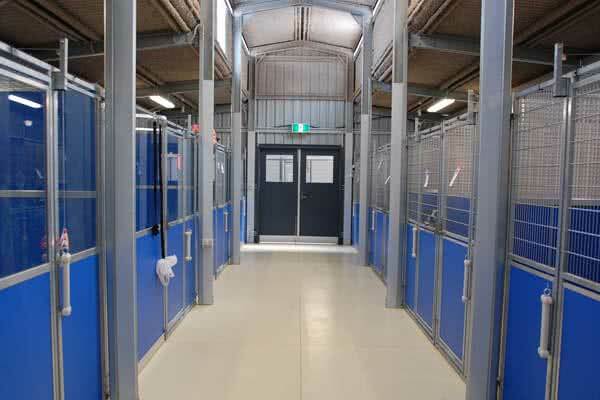 And no disruption of regular operations – a significant feature for indoor, dog boarding kennel businesses. Expand your operation to include room for training, bathing, feeding and more with absolute ease. Ideally suited to severe weather areas. 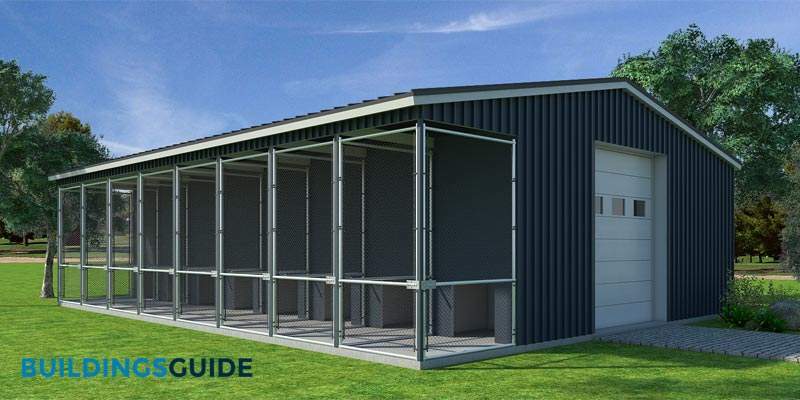 Nothing is more economical, durable or sturdier than all-metal prefab construction. Buildings are engineered to meet your local building code to withstand local snow, wind & seismic conditions. Energy savings with climate control result in ideal conditions, care and comfort for kennelled animals. Go Green! Buildings are produced from recycled steel and can even be recycled again at the end of their life. With inherent fire-proof properties, look for insurance premium savings of up to 40% compared to wood-built structures. Minimal maintenance, and mold rot and pest resistant – equals real operating cost savings. Plus, don’t worry about chewing with a steel structure. Super durable prefab kennel structures are a safe, intelligent choice. No painting, replacing rotten boards & roof tiles. Single Source Assurance provides a single warranty on the entire structure from one supplier — typically 20-35 years. Infinitely customizable finishing options are available on all buildings. Finish your facility in a choice of metal siding, hardy board, shingles or even brick. Before beginning to assemble your kennel, there are a few things that must be addressed. For starters, you will need to obtain any licenses or permits necessary to operate a dog kennel in your area. Additionally, as is the case with any building being constructed, zoning requirements must be followed. 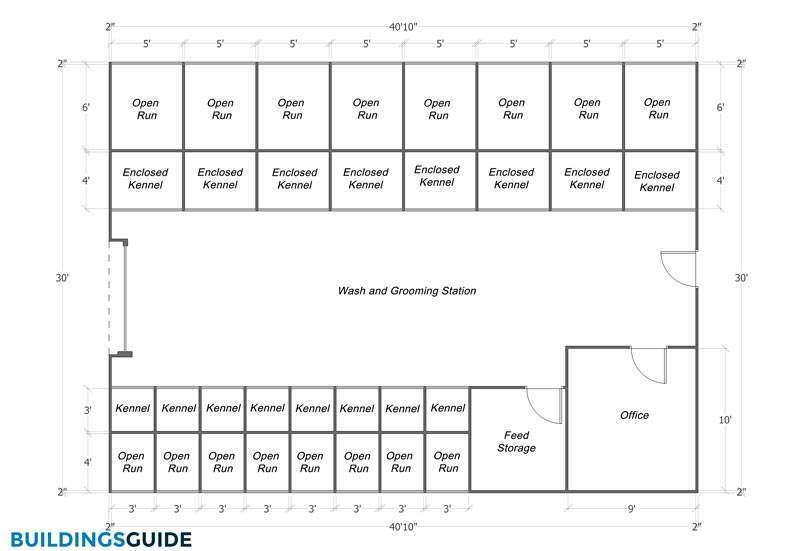 With standard size kennel/runs measuring 5’ x 10’, here are some typical building dimensions for varying sizes of facility. Once your kennel building kit is assembled, there’s still a fair amount of work to be done. The kennel is merely the shell of the dog-friendly facility you’re putting together! 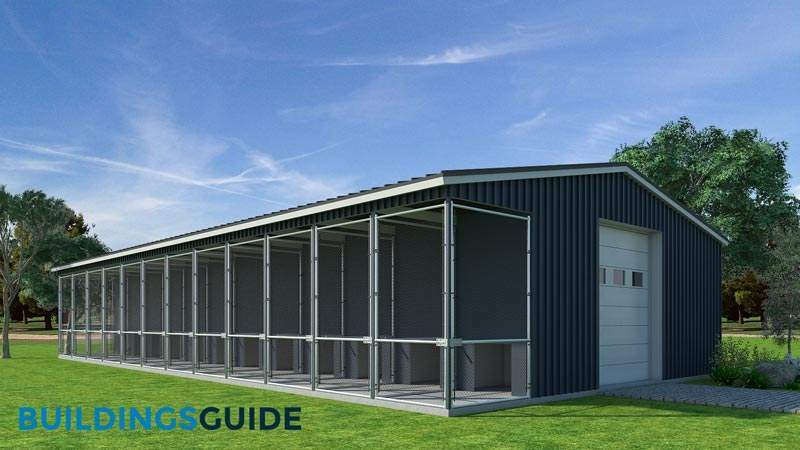 Pre-engineered buildings arrive on site with plans and build instructions. You have the option of either erecting the building yourself or hiring a local general contractor to facilitate the build. Filling out your kennel with the correct kennel-run areas is essential for a dog’s comfort and health, but what about the larger area? There are of course the basic needs that must be addressed: Lighting, cold water, shelter, proper ventilation, and cleaning. To give the dog’s in your care the best experience, using multiple flooring options is recommended. In the general area, uncovered, poured concrete is the best floor surface to maintain a sanitary kennel. In cages and other areas of the enclosure, rubber matting works wonders for an older dog with joint issues. Things such as cages & runs, water, ventilation, and flooring are necessities when opening a dog kennel. However, if you’re looking to go the extra mile for your guests, there are a few things you can accessorize the kennel with. Air filtration will have to be considered. Most facilities now use a combination of both UV air filters and plasma filters to help remove airborne pathogens and viruses from the air as quickly and safely as possible. Air conditioning & heating. Plan to have these installed professionally. You may also want to consider the option of underfloor radiant heating as this can usually be a more economical option and, as we all know, animals prefer laying on a heated surface. This would only be required for the indoor portion of the kennel/run. Hot and cold running water will be required for the dog washing station. Drainage. Each run will need to be fitted with drainage for easy cleaning and sanitization. Play areas are commonplace is most boarding facilities and other kennels, but those larger areas can be outfitted even further. Dog runs or agility courses help to keep exercise a regular part of their day during their stay. Going even further, something like a small pool can provide the dogs an area to interact, have fun and cool down all at once. Once your kennel is assembled and outfitted, but before you start welcoming guests and customers, there are two other important tasks to accomplish. As with any group of animals kept within a confined space, incidents can occur. Whether that’s a bite on a staff member or a fight between two dogs, liability insurance is crucial to operating your kennel with the safety of everyone involved in mind. The second task is to organize and finalize a plan for an emergency. An unexpected evacuation can be a catastrophe for a kennel with dozens of dogs and no clear plan. Even an emergency trip to the vet can be a major headache without planning ahead. For the safety of the animals and the peace of mind of the staff, be sure to have an emergency plan mapped out, and make sure all staff are well versed in it. 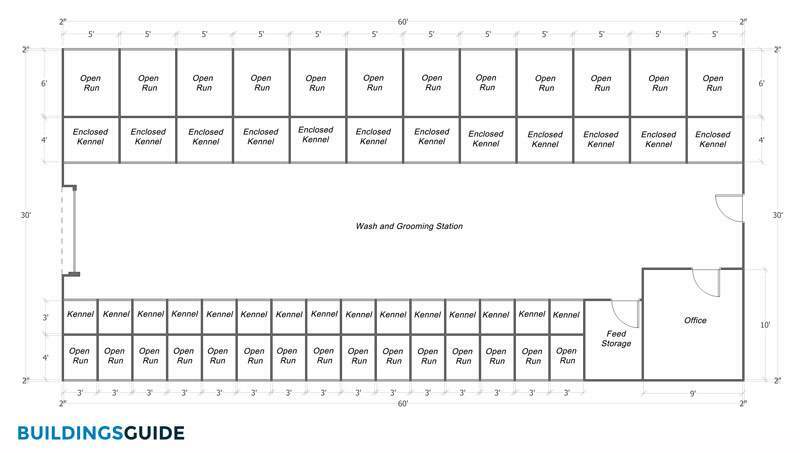 Illustrated below is a sample 30’x40′ kennel building with eight 10’x5′ enclosures for larger dogs along with a further eight 7’x3′ enclosures for small to medium sized dogs. There is also a 10’x9′ office space and a 7’x7′ feed storage room. Here is another custom kennel design measuring 30’x60′ that will house a total of 27 dogs in 12 large enclosures and 15 smaller enclosures. The flexibility allowed by prefab metal not only allows for ease of expansion; it opens up the range of potential uses. 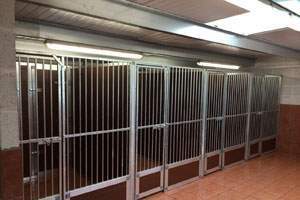 A steel dog kennel can offer an ideal choice for your needs, and up to 10,000 square feet, it can easily be dismantled and re-sold or moved to a new location. One of the most popular uses for kennels, boarding facilities are credited by the The American Pet Products Association 1 as being one of the main components of the fast-growing pet industry. Boarding kennels provide a range of services and accommodations for your pets, whether they’re canine or feline. Individual kennel/runs for overnight housing are commonplace, but a good boarding kennel will go above and beyond for your pet’s comfort. Additional services offered could include grooming, training facilities, pools, play areas and even a webcam-monitored area where an owner can check in on their pet while on vacation! Breeding kennels are pet-friendly and safe facilities whose primary purpose is to ensure the safety and security of the animals in their care. Professional breeders are tasked with maintaining a sanitary and happy environment for the dogs under his or her supervision. The main task for breeders are to maintain a steady level of puppies for sale without sacrificing the dog’s quality of life or health. 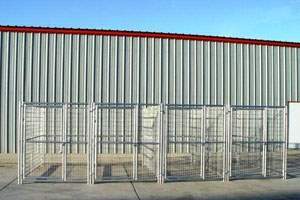 Most breeding kennels are mostly situated outside. Facilities outside achieve two different things: It allows the dogs to spend the majority of their day running around in a larger population outside, and it provides more space to work with a larger group of dogs. 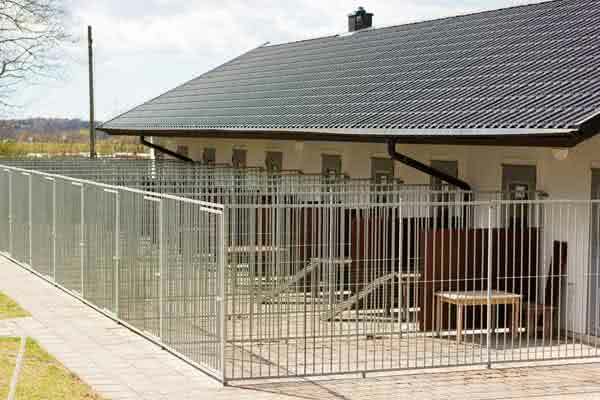 The second thing outdoor facilities achieve goes back to the primary goal of a breeding kennel, as well. A military support organization, Family of Military Working Dogs Equipment and Kennel 2 has revolutionized K9 units in the military, both for dogs and handlers. This support organization focuses on the well-being of the animal while providing the resources necessary to make every task a success. A Handler Set, which consists of leads, muzzles, collars, and harnesses, as well as everything needed for feeding and housing the dog. A Facility Set, which consists of more feeding supplies, a bite suit for training, toys and a weigh scale. An Obedience Course Set, which consists of obstacles necessary to train the animals for duty. A Canine First-Aid Set, which consists of everything needed for a dog’s well-being in an emergency. To protect all animals and ensure they live in a happy healthy environment the government has set forth several rules and regulations that relate to the housing and caging of animals. These laws were put into place in 1970 and still stand relatively unaltered today. The majority of the federal regulations address the design and layout of animal shelters. All shelters and housing facilities must be “maintained in good repair”, meaning all structures must be structurally sound, all windows and doors must open, close and lock correctly and any interior or exterior damage must be repaired in a timely manner. It’s not only the exterior and structure of the building that is important, but also the interior. All interior walls and ceilings must be painted. The entire structure must be cleaned on a regular basis and be made entirely from non-hazardous materials. If you are considering placing cages in your dog kennel there must be enough cages to house each dog individually and all animals must have enough space inside the cage to stand freely, lay down and turn around. Dogs must also be given room to exercise and play both indoors and outdoors. Playpens, or “runs” as they are referred to in legal documentation, must be at ten feet long and the minimum width required varies based upon the size of dogs housed in the kennel. Living facilities must also provide adequate shelter from heat and bad weather. These shelters must be large enough that all dogs can stay completely dry and maintain a healthy body temperature. Beyond just the size and design of the shelter, an appropriate dog kennel must also provide certain necessities for the animals. First off the structure be well lit, a source of light, equal to 30 candlepower or more, from either natural or man-made sources must be present at all times. Both cold and hot water shall be available at all times from a source within the shelter. The building itself shall be clean, and the routine removal or dirt and waste should take place every night. In addition, the kennel must be kept at a reasonable, comfortable temperature at all times. On top of providing adequate living facilitates, some states also require kennel owners to possess a boarding or shelter license. Most states have their own Animal Welfare Act, which will specify whether or not a license is needed in your state and how to procure one. Licenses cost between $25 and $100 dollars to obtain and must be renewed yearly. Most applications require proof of the health of your animals, documented no more than 30 days prior. These licenses may also require proof that living conditions and kennels are compliant with all federal and local regulations. Colorado: If the owner of a kennel or animal boarding facility is the recipient of a complaint documented by an authority they are subject to investigation and may be convicted of a civil penalty, which can result in a fine of up to $1000 per violation. Georgia: If a person owning a kennel or animal shelter fails to obtain a license they are subject to convicted of a misdemeanor. If animals are to be sold, or adopted by anyone not directly affiliated with the shelter itself it must be guaranteed beyond reasonable doubt that all animals are in good health. Indiana: Dogs may not be kept in a cage with a wire floor unless there is a structure in place which keeps the dog off the wiring. All dogs must be taken outside for a run at least once per day. Louisiana: No one person shall keep more than 75 dogs over the age of one-year-old at any time. If found to violate this regulation the owner is subject to conviction of a misdemeanor punishable by a fine of up to $500- or six-months imprisonment. Nebraska: State authorities may suspend an owner’s license or file an injunction or restraining order at any time, with reasonable cause, against any individual who has violated the state’s standards or animal care, or who makes threats to violate regulations. All animal handlers must wash their hands immediately before handling sick animals, and sick animals are to be taken to a licensed veterinarian within a reasonable time. Dogs must be given the opportunity to socialize daily. Pennsylvania: All kennels must be equipped with a smoke alarm and means to adequately put out a fire. All dogs must visit a licensed veterinarian at least once in a six-month period, and all kennels and housing structures are to be inspected at least twice per year. 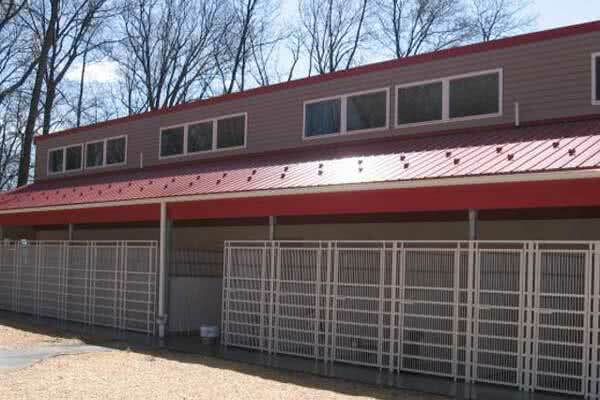 Steel dog kennel buildings are the practical, economical and intelligent choice for commercial dog boarding and kennel facilities.